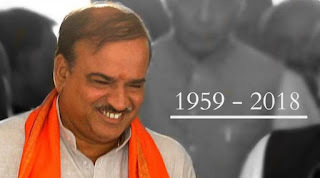 A staunch RSS ideologue and long-time BJP member, Union minister Ananth Kumar was the quintessential organisation man who kept Karnataka and the party as the twin focuses of his career. The Parliamentary Affairs minister, who passed away early Monday after battling lung cancer for several months at the age of 59, was the first person to speak in Kannada in the UN in October 2012 and was often regarded as the Delhi face of the Karnataka BJP. Kumar was a six-time member of Parliament from Bangalore South, a constituency that remained his bastion till the very end. Bengaluru’s “most loved” gregarious MP was known for his political adroitness, managing to be in the inner circle of the central leadership of BJP — be it during the heyday of Atal Bihari Vajpayee or Narendra Modi now. He was born to a middle-class Brahmin family on July 22,1959, in Bengaluru to Narayan Shastri, a railway employee, and Girija N Shastry. A graduate in Arts and Law, Kumar’s journey in public life began due to his association with the Akhil Bharatiya Vidyarthi Parishad, a student organisation of the Sangh Parivar. The strong political instinct was honed early on. Kumar voiced his protest against the then Indira Gandhi government’s imposition of Emergency for which he was sent to jail for about 30 days. With his steady political growth, his bond with the Sangh, where he was mentored politically, also grew stronger. Looking to get into mainstream politics, Kumar joined the BJP in 1987, going on to take up the responsibilities of state secretary, state president of the Yuva Morcha, general secretary and national secretary. Along with state BJP chief Yeddyurappa, Kumar was among the few party leaders who could be credited for the growth of the BJP in Karnataka. He was known to have had an often politically hostile relationship with Yeddyurappa and was accused of meddling in Karnataka affairs, when the Lingayat strongman was chief minister of the state. While being the all-important member of the BJP’s parliamentary board, Kumar was often regarded as the “Delhi face” of the Karnataka BJP and also for the state government, one who could be depended on to take up issues concerning Karnataka. Never an MLA, Kumar came close to trying his luck to become chief minister when the BJP under his presidency emerged as the single largest party in 2004 assembly polls. But JD(S) decided to support the Congress to form a coalition government. Kumar leaves behind his wife Tejaswini and their two daughters, Aishwarya and Vijetha.